My son wanted a camouflage cake for his 8th birthday. I used one of his army sweaters for a guide and randomly laid out the six colors. For the cake I just used an easy cake recipe and for the decorating I used black, juniper green, moss green and brown done in two shades then I laid leaves around the edge with leaf green., All in all I think he was very happy with the effect I know I am! 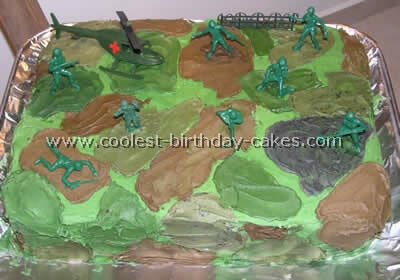 My son wanted an "army" theme for his 6th birthday so I came up with this "camouflage cake". It is unique because it not only is decorated on the outside but on the inside as well!!! 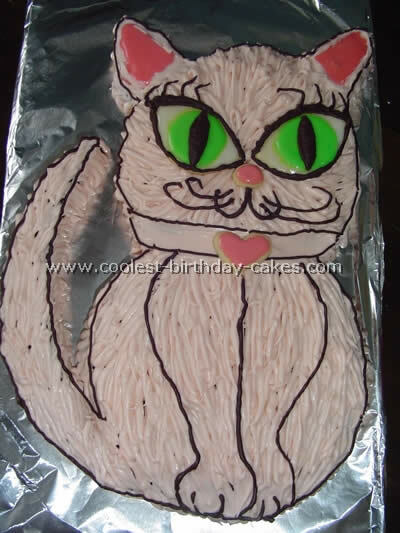 I used four marble-cake mixes making a two-layer cake for this easy cake recipe because there were so many children invited but you could adjust your recipe as needed. Mix up recipe as per package directions on marble cake mix (I used two for each layer) except divide batter into thirds; tint one-third with the "chocolate" as directed and tint another third green using food coloring. You can tint the final third a darker/lighter green than the first one or leave it as is. Spoon or ladle varying amounts of each color along bottom of prepared pan making a "camouflage" pattern and bake. 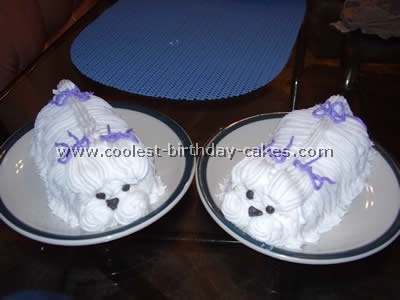 To decorate I used the Wilton buttercream frosting recipe as well as some chocolate canned frosting. I tinted the buttercream frosting several different shades of green and also added some white buttercream to some of the chocolate frosting to create two shades of brown. After frosting the entire cake one shade of the green I just randomly added the other colors on top to create a "camouflage" pattern. 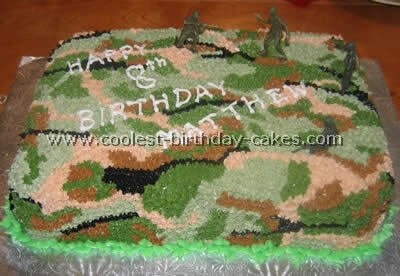 To finish off the cake I placed a few of my son’s favorite army figurines and accessories – the boys loved this cake – especially the surprise when I cut into it and the camouflage continued all the way throughout the cake. I wasn’t sure they’d want to eat the green cake but they dove right in! Even the adults said it tasted great. This cake was for a soldier going to Iraq. They wanted the whole cake camouflage. 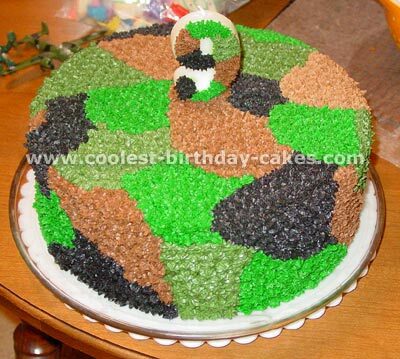 This is a very easy cake recipe, you just use the army camouflage colors for frosting and cover the cake. They loved it. My nephew wanted a camouflage cake for his 9th birthday. It was a 10" chocolate cake. 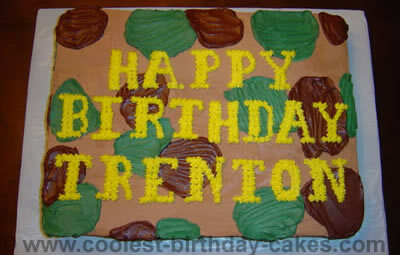 I used two different tints of green (leaf green & moss green) chocolate and black icing. 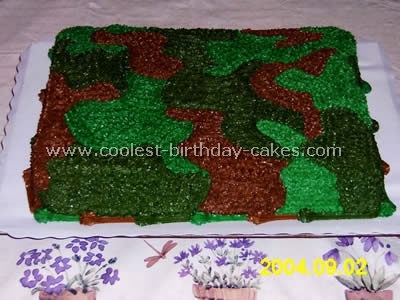 Here’s a birthday cake picture of a Camouflage cake for my nephew’s ARMY bash. I started with an 11"x15" sheet cake. I used 3 marble cake mixes and added green food color to the cake mix to give it the “Camo” look on the inside of the cake and that took everyone by surprise. There are three different color icings for the camouflage outside. The letters are made using the star tip.